Perennially between the months of April and November, the east coast of Australia including our beautiful Gold Coast froths with tail lobbing and breaching humpback whales that migrate from the feeding grounds in the southern ocean to the warmer waters of tropical Australia where they breed and calf. 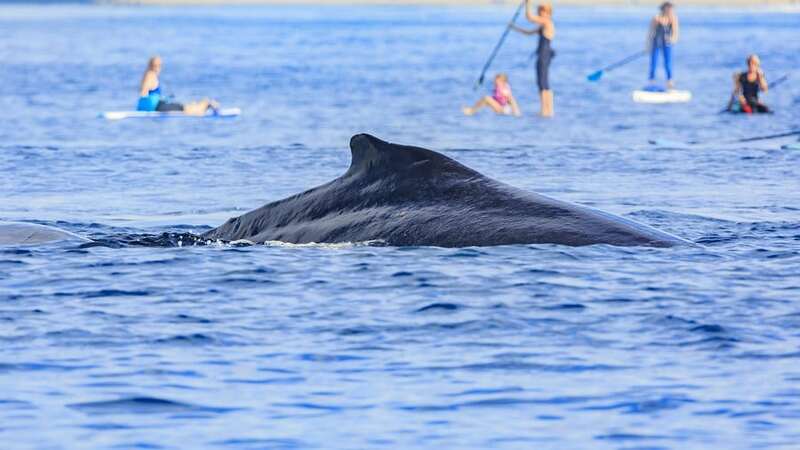 This annual migration can see individual whales covering more than 6000 miles, passing the Eastern Australian towns on the New South Wales and Queensland coasts such as Sydney, Narooma, Byron Bay and the Gold Coast. It is believed that the majority of humpback whales migrate north between June and August, and return to their feeding grounds in the south during the later months of September to November. Juvenile males are the first individuals to make their migrations, followed by the females and calves. It is assumed, while not known, that breeding takes place in the middle stages of the migrations, before they reach the tropics. The lagoons of the Great Barrier Reef are thought to be an area where the humpback whales breed and birth, yet there is a lack of evidence to determine that fact for sure. Recent studies have estimated between 25,000 and 30,000 humpback individuals are part of the entire east coast migratory population, and that in turn populations are growing by 10-11% every year. It is understood through tireless research that numbers were back to what they were before the mass hunting of whales in the Australian east coast, a barbaric act that ended in 1963. It was calculated that during the height of the whaling years one whaling station near Tangalooma took 600 whales in a single year. While soaring numbers of humpback whales is a promising sign for the relationship between man and leviathan, there are potential issues related to the boom. Primarily, is there enough krill and food sources throughout the southern oceans to support the whales during the migration, and furthermore with an increased population of humans, the risk of ship collision and shark net entanglement is another growing risk to the whales. Fortunately the Australian government ‘department of environment and energy’ have passed a myriad of laws for vessels when approaching whale species. For example crafts must stay at least 100 metres away from whale, and never touch or feed them at any time. Furthermore injury and stranding hotlines have been established across much of eastern Australia to focus on the protection of these creatures. Whale watching companies from the east coast, have seen a boom in industry over the last decade, with a myriad of people of all ages wishing to see the whales that frequent their coast. The Gold Coast is a perennial favourite for whale lovers, and when the whale season is open, there is nowhere better to encounter the majestic nature of the humpback as they move north to their breeding grounds. The Gold Coast is also home a world class research group Humpback and High-rises, led by Dr. Olaf Meynecke. If you would like to get involved and find out more about these majestic animals, you can join one of our Gold Coast Whale Watching and Marine Research Adventures ex Runaway Bay Marina or sign up for one of Dr. Olaf’s 3 day research and rescue expeditions. The post Humpback Whales on the Gold Coast appeared first on Gold Coast Dive Adventures.